Politricks’ cards are inspired by the various ‘tricks’ Filipino politicians have used to win elections. The ‘Free Lechon Day’ card references the practice of distributing roast suckling pig (a popular but expensive dish in the Philippines) to sway voters. 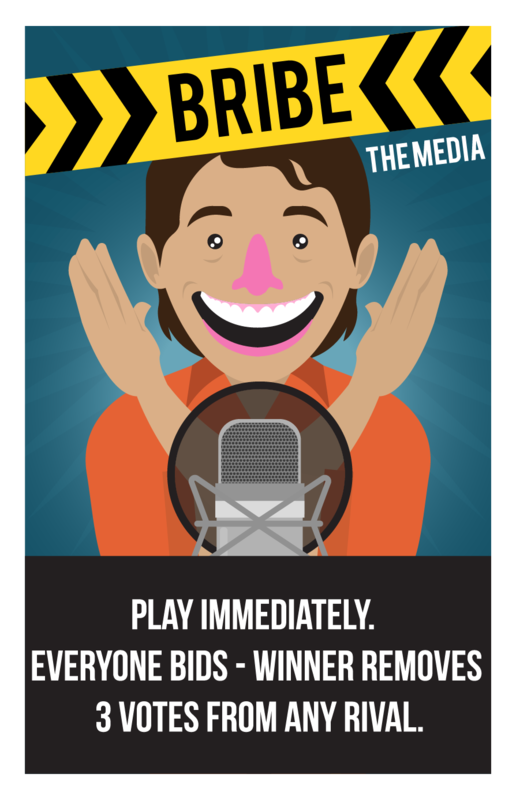 The ‘Bribe the Media’ card is inspired by cases of politicians offering money to journalists to cover their events or smear their opponents. 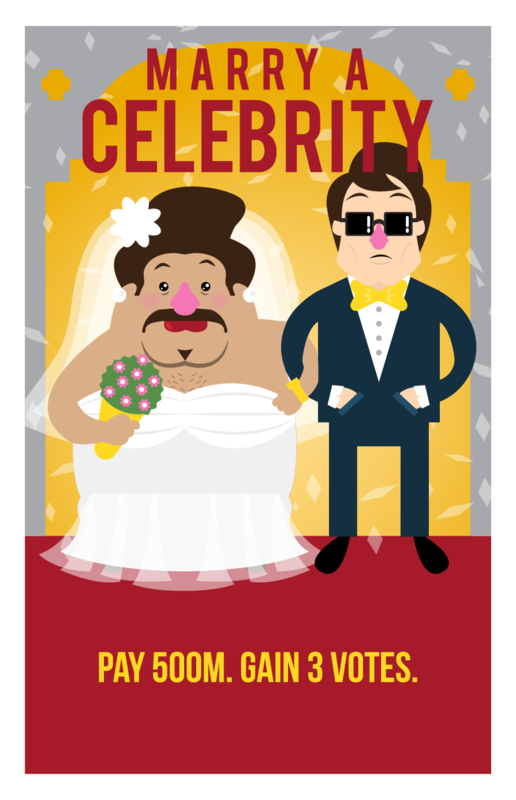 The ‘Marry a Celebrity’ card points to the fact that many politicians are married to celebrity wives—what many feel is a strategic ploy to boost popularity. 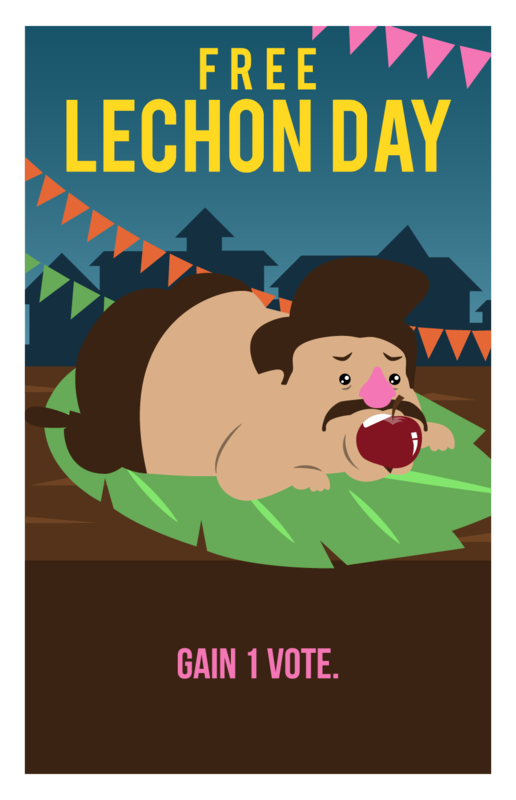 Politricks is a card game where players do whatever it takes to win the most votes in an election. Living up to its tagline of ‘Guns · Goons · Gold’, the deck of 104 cards offers players the tricks, trapos (Filipino slang for archetypal politicians) and money they need in order to ambush, rig and bribe their way into power. From winning votes by offering the public free lechon (a popular pork dish in the Philippines), disrupting rivals by hiring protestors, or gaining an unfair advantage as ‘The Military Man’, every aspect of this satirical game is based on real-life events in the Philippines and the country’s political culture. The ‘Pork Barrel Scam’ card, for instance, refers to a 2013 scandal where several members of the Philippines congress allegedly siphoned off funds designated for development projects. Another ‘Accuse of Foreign Blood’ card was inspired by the recent controversy surrounding presidential candidate Grace Poe. Rivals questioned her eligibility as Poe had renounced her citizenship when she emigrated to the USA, although the Filipino-born had reacquired it when she returned years before running for office. Besides cards based on historical events, there are also money cards denominated in the various bribes popular amongst Filipino politicians, including pang-yosi (cigarette allowance) and pang-load (mobile phone allowance). 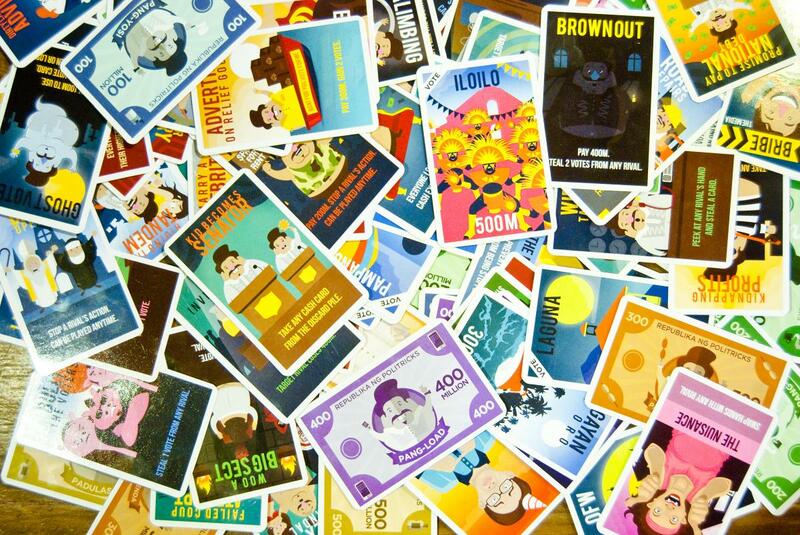 Besides entertaining gameplay, the cards also offer amusing designs by Filipino illustrators Christian ‘Ice’ Gecolea and Armelle Garcia. They centre on the character Sir Pol, who is depicted carrying out the various tricks in comical situations such as posing as a lechon and being caught with his pants down in an affair. With his bloated form, pompadour hairstyle, and wearing the barong, a traditional formal garment of the Philippines, Gecolea says Pol is the epitome of the ‘generic politician physique’ in his country. The character also bears an uncanny resemblance to Joseph Estrada, a former president of the Philippines, and now mayor of Manila. Similarly, the trapos cards look like caricatures of well-known Filipino politicians, including the previous vice-president Jejomar Binay as ‘The President’s Lapdog’ and Imelda Marcos, the widow of the late Filipino dictator Ferdinand Marcos, as ‘The Mayor’s Wife’. ‘It’s kind of unfortunate, yet at the same time funny, that a number of politicians here in the Philippines are easy to depict since most of them gained their votes by doing the most outrageous things,’ explains Gecolea. Since Politricks’ launch in March 2016, thousands of copies have been sold for 600 Philippine pesos (US$12.10/€11.20) a deck. During the run-up to the presidential elections, retail stores such as the Fire Sword Board Game Café in Metro Manila could hardly keep stock long enough to display it. J. C. Pulido, a partner in the café, calls the game a ‘fairly accurate’ portrayal of the state of politics. ‘While Filipinos won’t admit it out loud, almost all, if not all, of the dirty activities depicted in the game do happen behind the scenes during our national elections,’ he says. Corruption plagues Philippine politics to this day. 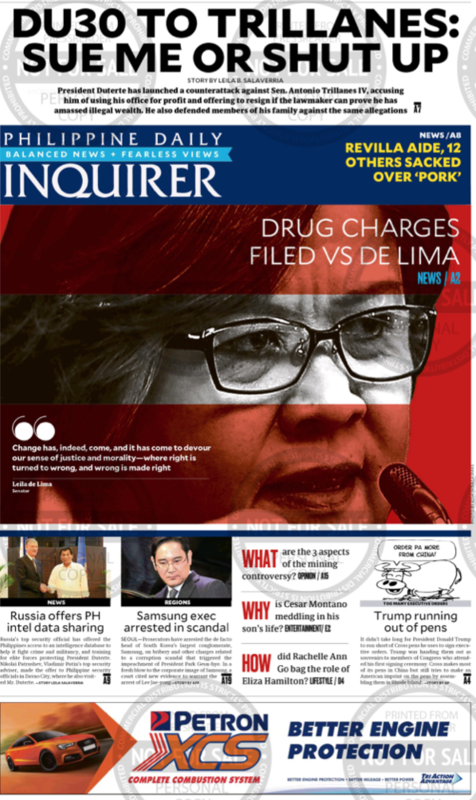 On 18 February, 2017 the front page of the Philippine Daily Inquirer featured stories about the current president, accused of using his office to gain illegal wealth, about a senator accused of peddling illegal drugs, and about officials sacked over the ‘pork barrel funds’ scandal. Although this entirely Made in Philippines game is about a less-than-savoury aspect of the country, Lim says they also tried to highlight the beauty which surprised him when he was based there for a year and a half. Politricks’ 19 vote cards depict the different regions of the Philippines, and illustrate their unique and colourful attractions from the mountainous ranges of the Cordilleras to the colourful Dinagyang Festival in Iloilo. ‘Whatever difficulty is thrown at them, the Filipinos remain optimistic and upbeat about life. But the country is not giving them the right opportunities,’ says Lim. ￼Justin Zhuang is a Singapore-based writer interested in design and culture. He was amazed at how everyday Filipinos use creativity to take on their politics.